The Friedrich Naumann Foundation for Liberty (FNF) Philippine Office sent 15 Filipinos to its International Academy for Leadership (IAF) in 2010, and they are now part of the IAF Alumni Group with a current membership of 200. 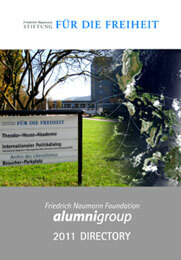 The group launched its 2011 Alumni Directory on 10 February 2011 at its annual general assembly held at the FNF Philippine Office in Makati. Also at the event was Liberal International (LI) Secretary-General Emil Kirjas who spoke about “The Effects of Social Media on Freedom.” “We hope that your network could spark more liberal activities in the Philippines and in the region. There is a greater opportunity to deliver good governance now that liberals are in power in your country. We also encourage you to connect with liberals all over the world,” said Kirjas who was in Manila to formally announce that the pre-eminent LI Congress will take place in the Philippines, which is the first time in Asia, on June 16-19, 2011. Department of Budget and Management (DBM) Secretary Butch Abad and Department of Interior and Local Government (DILG) Secretary Jesse Robredo are among the IAF alumni. The Alumni Group continues to grow each year. IAF offers online seminars where Filipinos always excelled in web forums. In November 2010, five young Filipinos bested other applicants from all over the world, and were sent to Gummersbach to attend the seminar on Strengthening Political Youth Organizations. As many as eight Filipino participants at one point have been sent to Germany. “We are optimistic that our future delegates will be able to apply the practical knowledge that they will gain from the seminars. 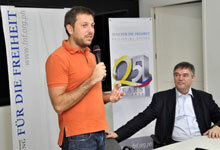 They will bring home liberal principles and strategies from Germany, and they can further contribute to building a Liberal Philippines,” expressed Mr. Jules Maaten, FNF Philippines Country Director.